New Thin Gripper has Higher Rigidity, Higher Grip Force, a Height of Only 39mm - and an absolute encoder as standard. The latest IAI grippers are equipped with battery-less absolute encoder as standard, meaning that a home return reset is no longer required after power cycle or emergency stop. The gripper retains it's position, and then recommences movement from that position. 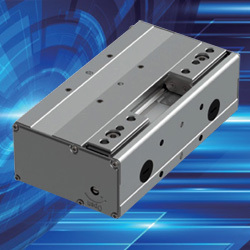 Mechanically, it is slimmer than previous models, offering greater flexibility in both mounting and cable exit options. This makes it suitable for even more opportunities on Cartesian, SCARA, or Articulated Arm Robots. Higher rigidity of the gripper body has also increased the possible length and overhang of the gripping finger when compared to conventional models. A pneumatic gripper is often the only non-electrically powered axis on an industrial robot. The launch of the IAI RCP6-GRT7 provides opportunities for designers to remove the air power completely, whilst improving overall accuracy and control. Home return is no longer required when restarting the equipment; you can move to the next operation while gripping the workpiece. The innovative design of this new series has reduced it's height by as much 55%, when compared to conventional grippers. Adopting an integrated body frame guide with proven performance for linear axes, means the gripping point distance and overhang amount have both been improved. 4-side mounting (including mounting on the finger operation surface), allows the wiring exit direction and surface to be changed. You can select the mounting/wiring position that best suits your equipment. The new range is 39% cheaper than existing IAI products with an equivalent stroke. If you would like more information about this new range of IAI grippers, or have a motion control application that you would like to discuss with our experts, give us a call on 01254 685900. They will be happy to advise you on the best solution for your application.